Home > Journal > Join the Pedal Revolution! 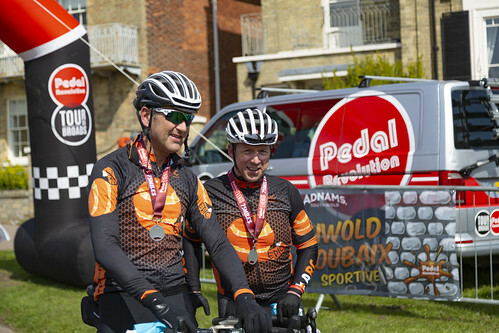 We had a great time at Saturday's Pedal Revolution Southwold Roubaix Sportive, where riders took part in either a 5-mile family ride or longer distances of 25, 50 the Roubaix or 75 mile routes. Well done to all the riders who battled through a hail storm and cold temperatures to arrive back home in bright sunshine. A refreshing Ghost Ship 0.5% and a shiny medal was their reward at the finish. You can collect a series of 12 ingeniously interlocking medals by taking part in a monthly commitment to cycling. Find out more here. View photos from Saturday's Southwold Roubaix event here.